The difference a service animal makes in the life of a disabled person is unbelievable and touching. Ask Danny Gleeson, a blind 49-year-old whose life became easier when he became friends with a special dog, Dylan. He acquired the Labrador crossed with Golden Retriever guide dog last August. “He is always happy, his tail is always wagging. 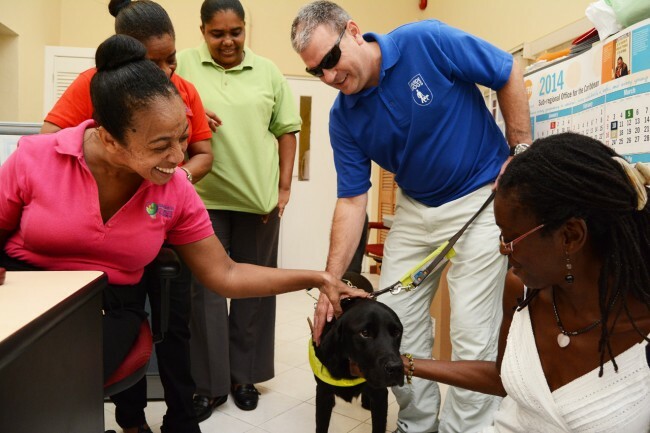 He is truly the best to me,” Gleeson told Barbados TODAY as he spoke fondly of Dylan in the Grace Adams Suite of the Grantley Adams International Airport where a reception was held for the dog that is here on a UK Guide Dog Abroad sensitization tour. Dylan was trained by the Guide Dogs Charity which breeds and qualifies service dogs to meet the needs of the blind community. In the UK, the almost three-year-old dog that Gleeson described as “priceless”, is allowed everywhere except in an operation threatre or in a working kitchen of a restaurant. 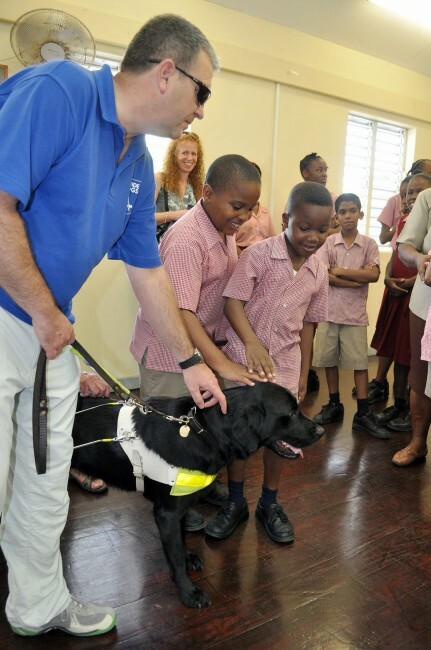 Having lost his sight at 23, Gleeson believes that guide dogs would go a long way in changing the lives of many blind people in Barbados. It is a process which he and an entourage from the charity are here in Barbados to assist with. The first move is to educate the public, he explained. “It is just about educating people about the difference that the dog can make. The dogs are very highly trained animals and because of the way we train them and the way they are with you they are fantastic and can transform somebody’s life,” he said. This morning, Dylan paid a visit to the Barbados Council for the Disabled at Harambee House, Garrison, St Michael before visiting the Irving Wilson School for the Blind later in the day. owner Danny Gleeson holds on to his leash. Students at the Irving Wilson School for the Blind meet Dylan.